Note: I started out writing this article about an update on the subject of crank arms shorteners, but it more less evolved into another topic so I changed the title accordingly. However, there is one thing that I noticed using them on my trike that I didn’t notice on the bike. With the crank arm shorteners installed on my trike I need to readjust my boom … lengthen it … as I am not getting the leg extension I need with the pedals relocated. I have not done that yet, but I should. It probably will require adding some more chain. That is the main reason I haven’t tried moving the boom out yet. It is winter out there folks and I am not too crazy about working out in the cold to accomplish this task. A rear derailleur is supposed to be able to handle about 2 inches of extra chain length as far as movement of the boom. That equates to approximately one inch of boom adjustment. However that figure is based on the boom position at the shortest length the rear derailleur handles to the position of the boom at the longest length it can handle. If the boom is already positioned out quite a ways within that range than most of that 2 inches is already used up. If this is the case then additional chain would need to be added. One nice option is to employ a Universal Boom Adjust Chain Tensioner designed for the boom of a tadpole trike. They are not cheap ($155), but they do make it easy to move the boom in and out and automatically maintain the proper chain tension. They are especially nice to accommodate various riders of differing sizes. The chain can be made up long enough to move the boom out for a tall rider and when the boom is shortened for a shorter rider the chain tensioner automatically takes care of the extra chain the rear derailleur would not be able to handle. Obviously there is a lot of extra chain and hardware involved and it might appear a bit unsightly to many (myself included), but they do work. You definitely would not want to run it into a curb or such as it would likely be damaged. TerraCycle (not to be confused with TerraTrike) manufactures these for several different brands of trikes. They can be purchased from some trike dealers and trike manufacturers as well. Catrike sells it for $150, but it is $145 at most of the other sources I have seen including directly from TerraCycle. The Chain Gobbler fits Greenspeed trikes and sells for $149. HERE is an article I wrote previously about crankarm length. Here is a video which explains the need and benefit of shorter crankarms. For a very long time now I have wanted to try using crankarms shorteners as they are supposed to help those who have knee joint issues. And it is said that short people should use shorter crankarms. I qualify on both. At my rehab physical therapy sessions I am going thru for knee joint replacement their stationary recumbent exercise bike has the crankarms adjusted to their minimum setting and that setting works great for me. I recently ordered a set of crankarm shorteners so I can pedal normally. With my 165 mm crankarms that came on my trike I have to place the heels of my feet on the pedals in order to pedal it. I tried pedaling my wife’s recumbent bike which I have set up on an indoor trainer out on the enclosed patio at the back of the house, but I couldn’t even pedal it with my heels on the pedals. I think it has 175 mm crankarms. I just am not “there” yet in my recovery. At rehab I can pedal with my feet positioned normally on the pedals. I even cranked it up to 100 rpm cadence a couple of times. So the shorter crankarms really do make a difference. I am really looking forward to having them on my trike. Yep, a set of these just might be your ticket as well. Shortens cranks by 24, 41, 59 and 76mm. I am pretty certain that I will be using the 59 mm position (next to the shortest) as that will give me about 106 mm crankarms which is close to the setting of the crankarms on the stationary recumbent exercise bike I am pedaling at rehab. The really neat thing about using these is that if and as one improves the pedals can be moved further out. I doubt if I would ever go back all the way to 165 mm though. LOOK OUT, IT’S A SNAKE! Some refer to these as Gaadi snake inner tubes. I am sure some would say … “It’s about time!” … that somebody came out with this product. It surely simplifies changing an inner tube. With this it is not necessary to remove the wheel. 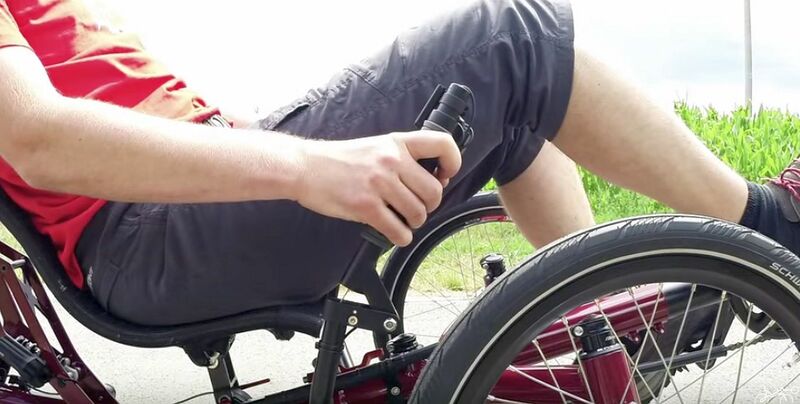 As long as you have access to the side of the tire you can accomplish the task with the wheel still mounted on the trike. They aren’t cheap … $15.75 plus shipping on Amazon (free shipping if your order is a minimum of $49). Also they are only available for larger diameter wheels (26/1.5-2, 26/2=2.25, 29 x 1.75-2.1, 700/28-35, and 700/37-42) … at least at this point in time. Perhaps they will eventually be available in other sizes. These double ended tubes would sure be nice to have available in 20 inch for those of us who currently have to remove the front wheels. They are available in both Presta and Schrader valve types. Here is a video showing how to install this inner tube. You can clearly and readily see how practical this is compared to a conventional inner tube. HERE is an article about them. Some tadpole trikes are easy enough to change the inner tubes on the front wheels without removing them as they have nothing in the way. Just tip the trike over on its side and have at it. However, some trikes have things such as fender braces in the way preventing this. Even so, the picture below shows the tube be inserted on a wheel that has fender braces. So maybe it would be possible to accomplish. By the way, a temporary emergency fix for a flat tire is to take the conventional inner tube out and cut it in two where it is leaking. Then tie a knot in both ends so it can be re-inflated. Try not to shorten the tube any more than necessary as it won’t be long enough to go all the way around inside the tire and this would be problematic. Of course, this emergency repair is only if you have no other means of making the repair. Some of us use twist grip shifters and some of us who use them complain about difficulty twisting them using the little finger and palm of our hands. Certainly on a diamond frame upright bicycle (which is what they were designed for) they are installed so that our thumb and opposing finger are positioned on the twist shifters making them much easier to twist. Trike manufacturers who installed these on their trikes have inverted them so that they are facing down instead of up. I have often wondered why they did this. Surely they know it is not how they were designed to be used and inverting like they did creates problems twisting them. But, hey, there is nothing that says we have to have them that way. We are free to invert them. The same is true of the brake levers if we want them inverted. It is likely that we will need longer cables if we invert these. Some homemade trikes have the twist shifters and brake levers inverted. When I made my first trike I positioned my twist shifters and brake levers inverted from the “industry norm”. Here is a picture of it during construction. I have to admit that I liked it this way and I have been seriously considering changing my setup around on my Catrike Trail trike. An available option is the use of “brake cable noodles” to help make the sharp bends without binding or damage to cables trying to curve them more sharply than one might normally have them. Although they are made for brake cables I have read that they can be used on shifter cables as well. 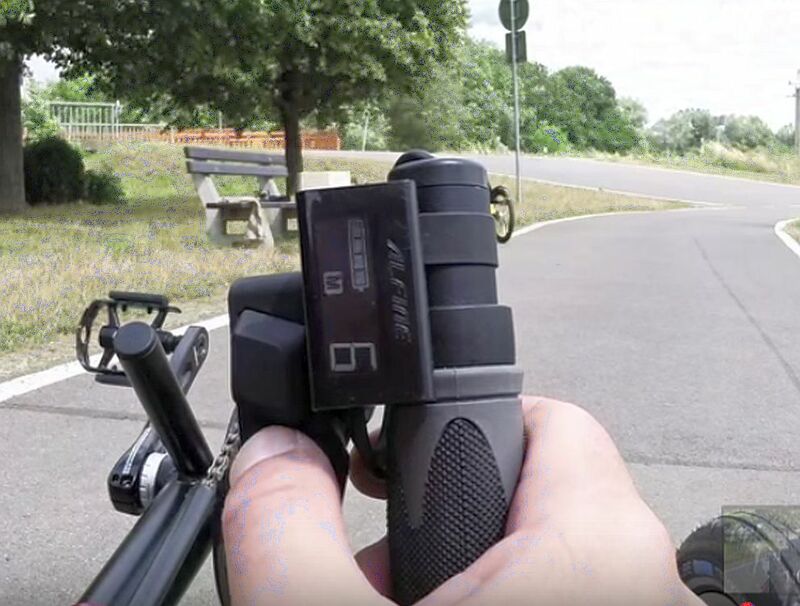 Although the image below is not of an inverted shifter it still serves to illustrate the use of a noodle on the brake lever. Notice how tight and neat the curve is keeping the cable from being stuck out into outer space so to speak. BTW, the brake lever does not need to be inverted unless one desires to have it inverted. It will function fine the other way around when the twist shifter is inverted. Indeed, if your handlebars are positioned fairly close to the wheels/tires you may not want your brake levers inverted from the industry norm. 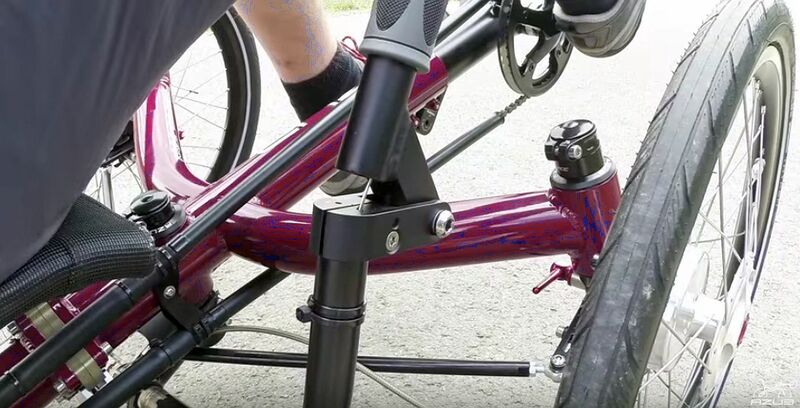 Utah Trikes has announced that they are now offering a rear wheel extension kit for all Catrike models. “All of our SolidWorks training has paid off and we have created a very nice extension kit that will allow you to put a 26 inch or 700c wheel on your 20-inch Cat. Catrike owners have been asking for these from us for a couple of years and we have finally finished the prototypes. The results are fantastic. So, what am I talking about? Well, let’s suppose that you bought a Catrike Road a few years ago and then the Expedition came out. Well, you really like the Expedition with its longer wheelbase and larger rear tire, but you have a lot invested in your trike. Up until now your only choice has been to sell the road (or give it to your significant other) and then buy an Expedition for yourself. While there is nothing wrong with that (after all, we are more than happy to sell you an Expedition) it may not be in your budget. Our kit includes the machined extensions and bolts. We are working out the exact parts for each kit, as some will require additional chain routing modifications. Our extension kit is setup with the OEM mounting for a Rohloff hub and we’ll have many other wheel choices. Our Catrike Wheel Extension Page shows our last prototype. We are going into production within the next two weeks. The final version will appear a little different in that it has disc brake dropouts and is black anodized with lazer engraving. We are trying to estimate how many to make on our initial run, so please let me know if you are interested. We should have pricing for the different kits up by next week. I could not agree more. Everything I have seen Utah Trikes offer from their own resources is always excellent quality. They have offered an extension kit for Catrike models for some time, but when Catrike changed the frame in 2013 the extension they were making and selling would not work on the new frame. So until now owners of the newer frame did not have this option. Here are links to the two different products. When I was growing up most of my bicycles were single speed as that was most common in those days. In my teen years I finally got a Schwinn 3 speed Sturmey Archer internal hub which I bought with my own money. I remember going to the Gambles Hardware Store where the local Schwinn dealer was located at that time and ordering my bike. It was white in color with chrome fenders and I thought it was so beautiful. This is the only picture I have of it and as you can see it is a poor quality picture. I have had some nice bicycles thru the years starting as a child, but I don’t have any pictures of any of them other than this one. Anyway, don’t quote me on any of this as I haven’t researched the development of power trains of bicycles. I am going strickly from what I remember as I grew up. I first saw the 3 speed internal hubs and then the derailleur system made its appearance. I think the first one was 5 speed and thru the years we have seen that numbers increase dramatically in both external and internal hubs. Rohloff makes a 14 speed internal hub. Just a few short years ago 10 speed cassettes became the industry standard and now it is 11 speeds. For those who don’t understand what I am talking about I will explain. The word “speeds” refers to the number of cogs (sprockets) on the cassette. The cassette is the name of the group of cogs on the rear wheel. Here is a picture of an eleven speed cassette. As is often the case there have been conversations, controversy and concerns about going to yet one more sprocket back there. Some say that it will result in wearing out faster as everything is thinner and therefore weaker. I would have to admit that such an argument makes sense. But is it reality? I guess only time will provide the answer to that. Meanwhile there are those who are taking a look at it and reporting what they have experienced thus far. HERE is an article on the subject. I am not aware of any trike manufacturers offering 11 speed cassettes on their trikes yet. My 2009 Catrike Trail came with 9 speed cassette. Later Catrike came out with 10 speed cassettes on their trikes. It is my understanding that in order to go to an 11 speed cassette a new wheel is required as those used for 10 speed cassettes won’t work. Mind you I don’t know much at all about any of this. I am just going by what I have read about it … and that is very limited. Yes, I know I have not mentioned the modern day internal hubs which are available options … and I am not going to … not here, not now anyway. I have written other articles about gearing and sprockets. There are still other articles you can discover by simply searching for words like: internal hubs, gearing, sprockets, derailleurs, cassettes, chains, etc. Just type the word into the search box and click on GO. For sure it is nice to have multiple gears to choose from. They are especially appreciated come hill climbing time. I miss my Sturmey Archer 3 speed hub and would like very much to have one in my Catrike Trail’s drive train. 81 speeds would be great … especially when I need to downshift and can’t with my derailleur system … cause I am already stopped or nearly stopped and didn’t get downshifted as I should have. Being able to downshift while sitting still would be great. Of course, SRAM also makes one I would gladly settle for one of those in place of the Sturmey Archer. Belt Drive is not new. Several motorcycles have used belt drives for many years now. Trek Bicycle has tinkered around with belt drive for their bicycles. I love belt drive on motorcycles and ponder over whether it would be as good on bicycles. In Trek’s own words … “a movement to bury the finger-pinching, pants-munching, rust-prone sprocket and chain, and usher in a new era of belt-driven bikes.” The only thing about it I can see that comes into play is multiple speeds. An internal gear rear hub would be needed as derailleur systems would not be possible with belt drive. At least I don’t see how it could be done. Along with an internal gear rear hub I think one would also need 2 or 3 speed internal hub built into the crankset. Of course, these items add considerable expense to the cycle. Still as times goes along the savings one would experience in chain and sprocket replacement would offset the initial expense. Hmmm, I wonder why we don’t see belt drive tadpole trikes? On motorcycles the drive belts seem to be quite strong and hold up very well. They are made pretty tough … heavy duty … as they have to be to handle the high horsepower involved and the performance the motorcycles are capable of. Obviously a bicycle application does not involve any of this and so the belts are made much lighter duty. Never the less they are still pretty strong and under normal circumstances should hold up quite well. One of them I read about claimed it would last as long as 4 chains. This one pictured below is reported to have gotten cut while off road riding. The damage led to its total failure. Of course, with a tadpole trike the drive belt would either have to be extremely long (not practical) or use at least two drive belts and some sort of a jack shaft in between. I read that the belt tension is critical and that weather (temperature and possibly humidity) can cause problems with tension. Perhaps the cycle frame is changing with temperature changes and not the drive belt, but still the end result is the same. Anyway, the person reports that in the winter time the drive belt seems to lengthen slightly and thus require minor re-tensioning. Then when warmer weather returns the drive belt seems to shorten slightly so that the belt needs readjustment again. Whether or not we will ever see drive belts used on tadpole trikes is something I guess we will just have to wait and see.